Scam PTC Sites: Learn How To Spot and Avoid Them Using the 13 Tips found below. Thousands of people are joining paid to click websites every day, hoping to make an extra income online. The paid to click industry offers an easy way to Internet users worldwide to earn an extra income for them and their families. Unfortunately, as in any sector in the offline and the online world, there are ”good” business owners and ”bad” business owners. Good Business owners are always trying to help their clients, while on the other hand, bad business owners are always trying to find ways to scam their clients and earn even more money. The same scenario is happening with the PTC industry. Hundreds (literally) paid to click websites are ”sprouting” every day, with their administrators trying to lure PTC users (usually newbies) to join them, promising them riches and glory. Some of these paid to click websites are scam PTC sites while other are good PTC sites. In general, 90% of new PTC websites are either run by scammers or cannot compete with other established paid to click websites, leaving their users with empty pockets and a big loss of their valuable time. 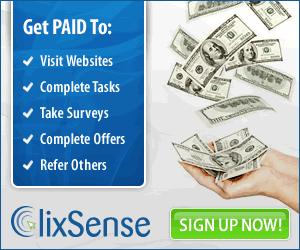 In my opinion, the most trusted and best ptc website is Clixsense. It’s been running since 2007 (over 8 years) and it has over 6 300 000 members. Click Here to Join Clixsense or Read My Honest Review. In this article, I will tell you 13 tips that will help you to spot, understand and avoid scam ptc sites. I suggest you read this 13 points well and always consult them before joining a ptc website. 1. The ptc website pays users more than $0.01 per click. If a paid to click website claims that it will pay you more than $0.01 per ad click then simply don’t bother joining it. With mathematical accuracy, the PTC website is going to shut its doors in less than 6 months or it is going to stop paying its members. To understand this, you need to understand how PTC websites work. For this reason, I have prepared two examples. The first example is from a trusted PTC website and the second example is from a scam PTC site. The ptc website pays its members $0.001 per ad click. So, $0.001 X 10.000 clicks = $10. The advertiser comes to the PTC website to get cheap traffic. He buys 10.000 clicks to his website for $15. Each click costs him $0.0015. The paid to click website just made $5 as a profit. The PTC website pays its members $0.20 per ad click. So, $0.20 X 10.000 clicks = $2.000. Do you really think that any internet marketer will pay $2000+ to buy traffic from a PTC website? No one will advertise to the scam PTC, hence no income for the scam PTC, hence no money to pay its members. $0.001 for 5 to 10-second ads. $0.005 for 15 to 20-second ads. $0.01 for 30 to 40-second ads. $0.02 for 60 and over seconds ads. 2. The paid to click website does not have a forum. Forums are places where people from all over the world can meet and exchange thoughts about a particular subject that interest them. All legit PTC websites have a forum. It is the place where their members meet and talk about the PTC website, exchange ideas, suggest new features to the admins and send their payment proofs (very important). Every PTC admin who is serious about his PTC business has a forum to communicate and help its members. Scam PTC websites usually don’t have forums because they want to avoid unhappy members from posting bad stuff about their paid to click website. Also,by not having a forum, you can not see if there are payment proofs. So, be Very Suspicious when a PTC website does not have a forum. 3. The PTC website looks ugly. This is the easiest to detect probably scam factor. Usually, an ugly-looking PTC website shows that its administrator is not serious enough about his business. He just went and bought the cheapest available PTC script, set up a PTC website to make some quick & easy money from the early adopters in the PTC industry. Legit PTC websites, on the other hand, have a nice looking interface and their administrators are constantly upgrading and evolving their websites graphics and they add new features for their members. These administrators are people who invested a lot of money and time to set their business up and they are more serious in making their PTC website grow and become successful. So, I personally avoid crappy, ugly-looking PTC websites and I suggest that you should too ! 4. The Ptc website does not have a unique script. There are two ways you can start your own PTC website. Either by buying a paid to click script from websites like ptcpay.com and evolutionscript.com or by creating a custom unique script. Now the same rule applies as before (point 3). Serious entrepreneurs (in our case, future ptc administrators) who are looking to build a stable and long-lasting profitable business, will not buy a script for their new PTC website that will look the same as 100 other PTC websites. Serious ptc administrators have already checked their competition, identified their strengths and weaknesses and they told their web developers to build a unique script for them, with no other PTC website looking the same as theirs. On the other hand, not-so-professional-PTC-admins-wannabe, they just simply buy a script (a ready-made ptc website) add some graphics and start promoting. If you are serious on dealing with PTC websites, then this is something worth taking into consideration. This is one of the most important things that you need to check before joining a PTC website. Admins contact details (email,phone number,fax number, physical address). For How Long, The Domain is Registered for. Ptc websites that are run by scammers, usually hide this information from the public. Let’s see an example, by comparing the whois information of two websites, Clixsense – my favorite ptc site and twodollarclick.com – a scam ptc website. You can do the whois search by your self. Just go to whois.com and enter the website’s domain name to the proper field and hit Green whois button. As you can see in my example, Clixsense has all its information wide open to the public, while twodollarclick has its vital information hidden. Also, check the registration expiration date for both websites. Clixsense expires on 2021 and twodollarclick on 2015. 6. The administrator had PTC websites that scammed people in the past. Admins who scammed once, they will scam people twice using the same method. They will just create another PTC website with a different name and wait for PTC newbies to join their new scam PTC websites. You can get the admins name from whois.com. If the name is not available to the public, then my suggestion is not to bother joining at all ! 7. The paid to click website offers Rented Referrals Option. This is a very controversial topic between the PTC community. After I got scammed from the renting referrals scheme (that almost all PTC websites today have), I searched the Internet and I have found some undeniable proofs that those referrals you are renting, are not real humans. They are computer bots, programmed to always make you lose money instead of earn money. If you buy 100 referrals worth $20 for 30 days, at the end of those 30 days you expect to earn $21 or more. Instead, you are always earning $19 or less. Don’t tell me that you haven’t noticed this. I have written a post about this subject. It is called: PTC Users Beware: The Renting Referrals the renting referrals scam Exposed. I highly recommend that you read it. It will literally open your eyes. I consider the administrators who earn money with renting referrals from their websites NON-ETHICAL. So, I cannot trust someone who is not ethical, who does not have values and neither should you ! 8. The paid to click site has many upgrade levels. Another NON-ETHICAL method, scam PTC administrators use to take your money, is by offering multiple levels of upgrades. Legit PTC websites offer only one level (maximum two) of an upgrade to their members. Scam PTC websites offer multiple levels of upgrades usually called with different names of precious metals such as Gold,Platinum,Sapphire and other..
Legit PTC websites earn their money from advertisers, not from membership upgrades. So, again, people who run PTC websites and ask for multiple account upgrades are using non-ethical methods to earn money. These people are not to be trusted and they will not hesitate to stop paying their members or shut down your account for no reason. 9. The PTC website offers free membership for the first 1000 members. This is a common practice scammers use to lure members to their PTC website. They offer a free Membership to the first 1000 members and when that number is met, they change their offer to free membership for the first 1100 members. Again, a non-ethical method to run your business. Do not trust people who are not ethical and who do not have values. These people will not hesitate to scam you. 10. The PTC website has misspellings on its copy. This is something that you should always look into, not only on PTC websites but in every money-making opportunity you are planning on joining. If you see many misspellings on the websites copy, this means that the people behind the website are not serious enough. Have you ever saw a well-established website to have misspellings on its website copy? I’m sure your answer is no. It is my policy, when I see a PTC website with misspellings to leave from it at once. I want to deal with serious people and not waste my time with amateurs. 11. Check Ptc Reviews on different forums. Before joining a PTC website, I suggest you check for reviews on various websites and forums. Ptc-investigation.com is a good website to check for reviews because it has reviews and comments from everyday people like you and me. Another good PTC website to check for reviews is ptccentral.com. The guy who operates the blog writes honest reviews about various PTC programs. Make sure to check for comments and reviews on various forums. I suggest you visit talkptc.com and talkgold.com and ask for comments or reviews on the PTC website you are interested in joining. 12. The Ptc website does not have PayPal as a payment processor. Recently, PayPal, the online payments processor giant, announced that it will no longer accept paid to click websites who are suspicious on scamming their members to use its services. PayPal is worldwide known as the safest and trusted method to pay and be paid online and it will not allow scammers to hurt its brand name. So if you do not see PayPal as a payment processor on a paid to click website, then be very cautious and sceptical on joining it or not. 13. Join PTC websites that have been up and running for a long time. As I said before 90% of a new PTC website will eventually fail and shut down their doors. The reason is there is fierce competition among PTC websites. a steady amount of new members. Most PTC websites fail on just one of these three points. Big players like, Clixsense, neobux, Worldlinx and Scarletclix have established their presence among the ptc community and they get all three points mentioned above steadily increasing every month. By joining these PTC websites, you can rest assure that they will never shut their doors and you can invest time and money to grow and become successful. Bookmark this page and visit it every time you are thinking on joining a ptc website. Scam PTC sites are everywhere, so I suggest to run away from them as quick as you can when you find at least one of the points above matching with it. If I forgot to write something or if you have something to share with the rest of the community, please do so in the comments section below. Hello and firstly thanks for stressing out the things everyone should avoid. I could agree that ClixSense is far the most trustable/established website I would freely say ever. Why? Well, all of those who came in before don’t have such a good business plan — the main issue. Whilst all those who came in after ClixSense were ether trying to copy-paste the ClixSense-appiied technique or simply could not find the appropriate one as a business plan. Furthermore, have anyone ever heard about ClixSense being terminating their User IDs? Less likely to ever happen. Furthermore 2, opposite to ClixSense competitors, they have never been changing click rates nor anything crucial related to the site’s health affecting the Users’ earning opportunity in front of all. There are tons of other reasons, but this comment would rather look like a blog post… At the end, ClixSense is simply the best PTC site ever. Clixsense is one of the best! Thank You very much for your review. May I contact you through mails in the near future? Not sure if I agree with your point about the importance of a forum on a legit PTC site. I mean, If I were running a scam PTC site with a forum, you can be sure that I’d post fake payment proofs and delete all the negative comments and complaints. Better to follow point 11 and check the PTC’s reviews on third party forums. A scam ptc website can’t run away from angry members that want to ”scream” about non-payments and other bad things. Also, any ptc website with legit intentions, will have a forum. Having no forum for me is a sign of ”weakness” and a big No-No.